Shatabdi Chakrabarti has been a media professional for 14 odd years, starting her career with NDTV. 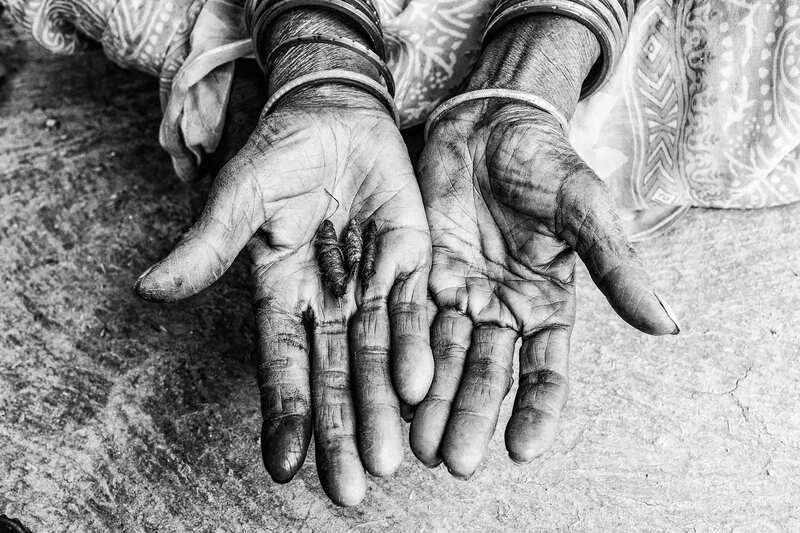 She has worked extensively in making documentary films and advertising films along with pursuing photography, particularly documenting the diverse tattooing practices prevalent in India. 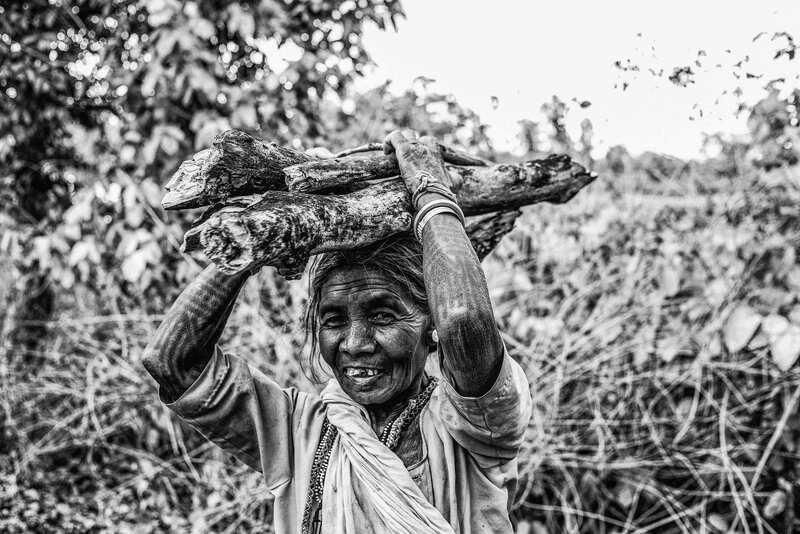 She made her debut as a filmmaker a few years ago with a short film titled ‘The Man and his Saree,’ which questioned the idea of the ‘gaze.’ Her travel and wildlife stories have been published in Indian and international publications like Vice, Terrascape, Mirror UK and Daily Mail. Shatabdi was also the lead photographer for a coffee-table book on the popular music band Indian Ocean. She is currently associated with Barcroft Media as an Editorial Producer, along with working on her first full-length documentary film. She also writes for Tattoo Cultr, India’s only online tattoo magazine. Human life can be summed up as a continuous quest for self-identity. Individual identity is necessary for inclusion into peer groups, because humans are social animals and we need to be a part of a larger community to survive. 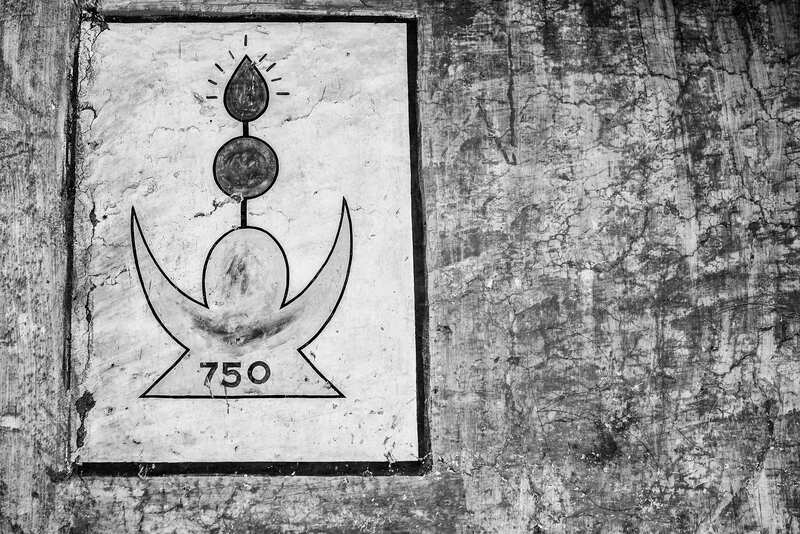 For these reasons, human cultures have, since prehistoric times, created visual markers that tell stories of the self and of communities these marked bodies belong to. This quest for visual markers was perhaps the reason why humans first started scarring, piercing and tattooing their bodies. As civilisations became more complex and diverse, the tattooing culture expanded its role to suit a wide range of purposes. Tattooing transcended from being purely semantic (providing meaning) to serving spiritual and aesthetic purposes. 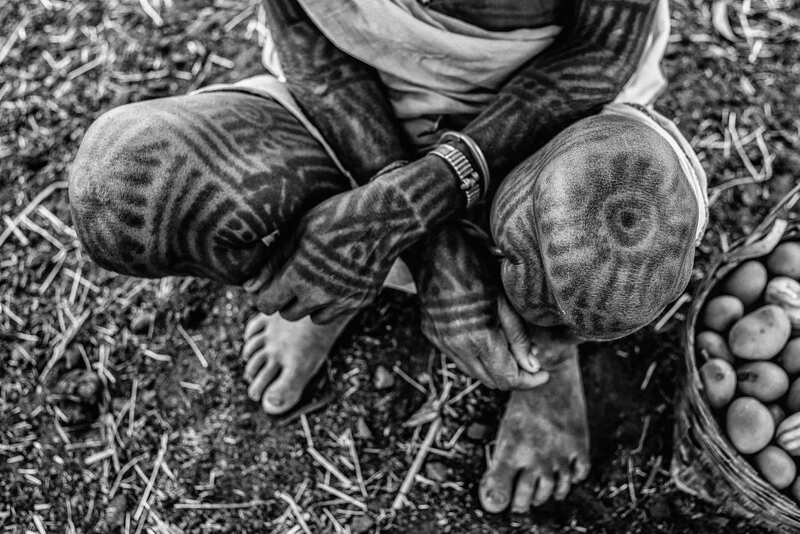 Over time, tattoos have been used as markers denoting rites of passage, symbols of birth status and social rank, iconography related to religion and spirituality, insignia of victory in hunting and battle, display of sexual virility and fertility, protective talismans for love and luck, and much more. However, not everything about tattooing was related to meaning or expressing creativity. 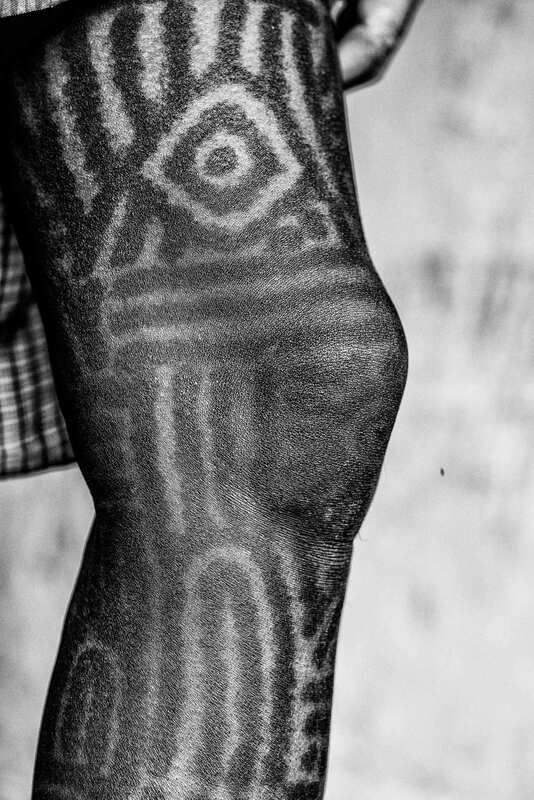 Tattooing was also used as a form of marking ownership, brutally used to brand outcasts, slaves, minorities and criminals. My interest in tattoos has inspired me to delve deep into this tradition found in various cultures of our country. 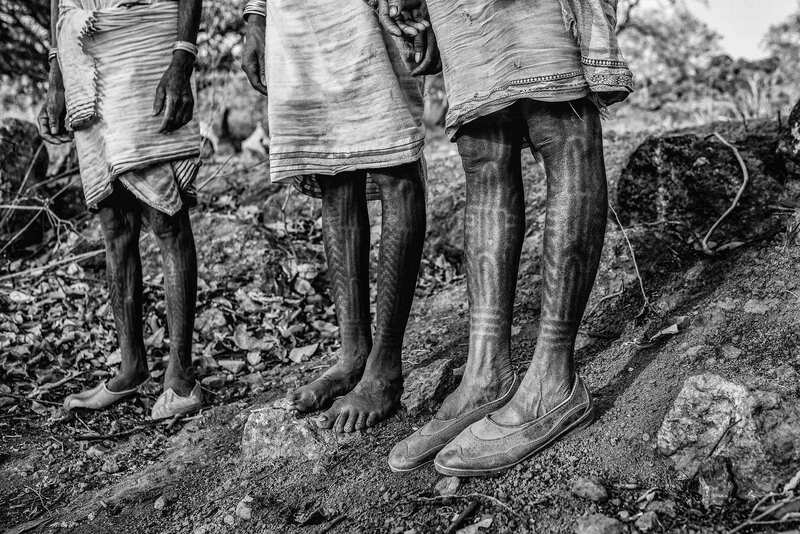 During the course of my research, I had previously explored the tattooing traditions of tribes like the Apatanis in the North-East. 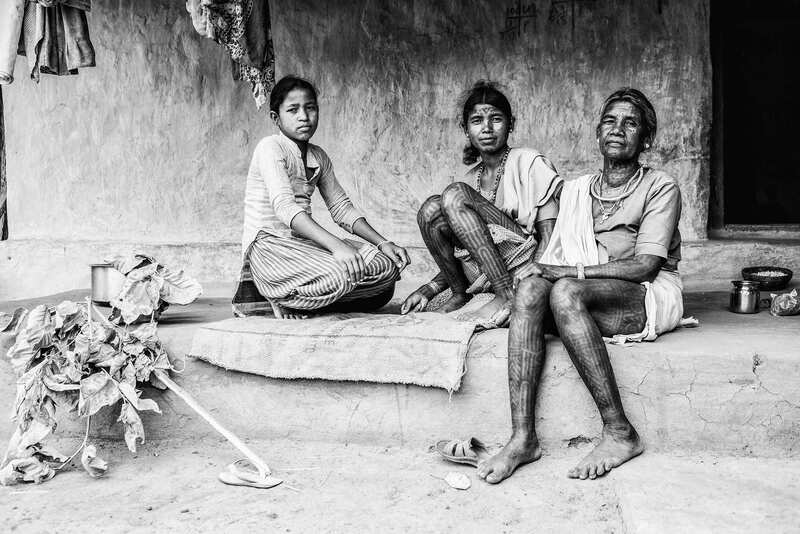 This time, I wanted to expand my study to the Baiga tribe scattered in the states of Madhya Pradesh, Jharkhand and Chhattisgarh. 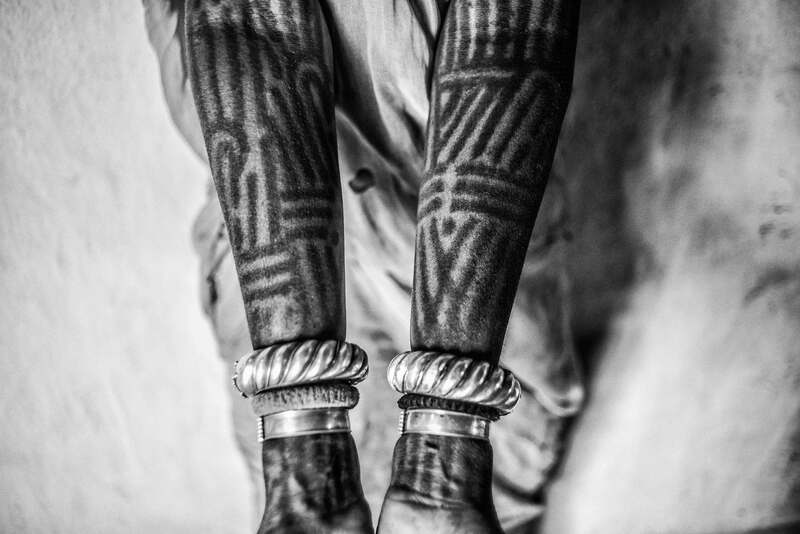 Traditionally, Baiga women made elaborate tattoos on their forehead, arms, legs, back, neck and breasts. 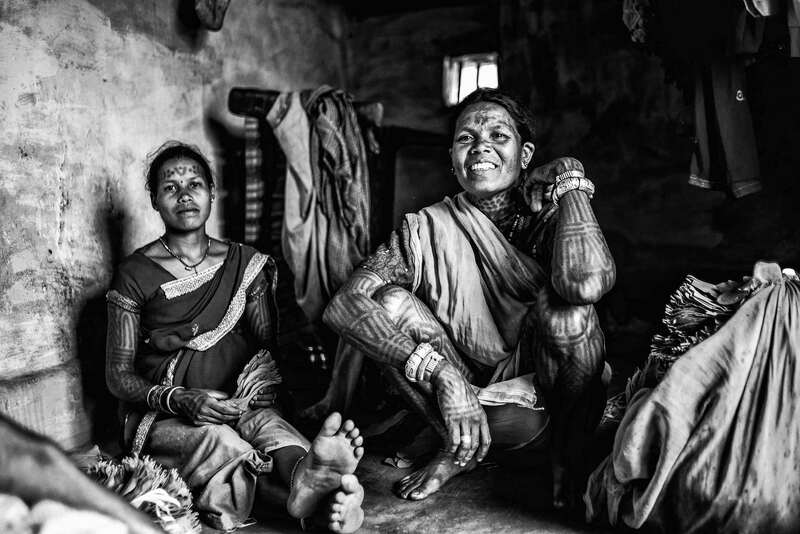 For Baigas, tattoos are strongly linked with the beauty of their women. They also believe that tattoos are carried into the afterlife because the ink integrates with the body itself. 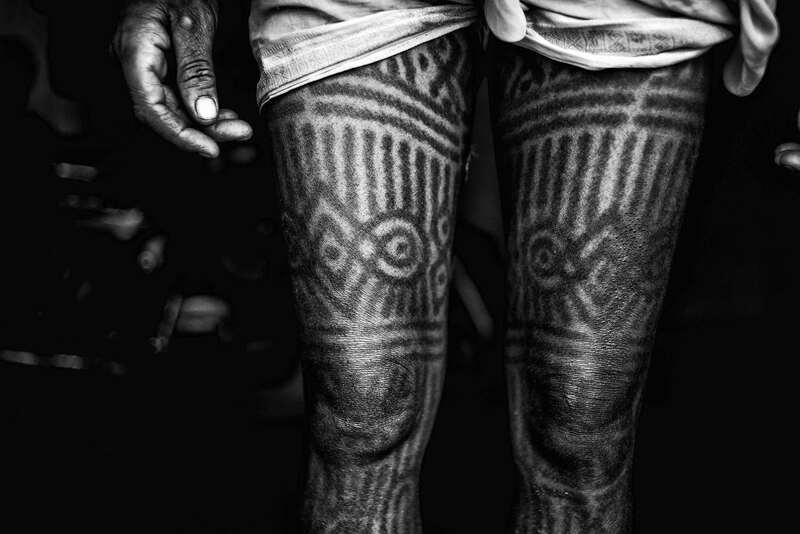 The Baigas are a forest-dwelling tribe and the motifs of Baiga tattoos are primarily inspired by nature. They consider the cow’s eye to be beautiful and enigmatic, hence the ‘cow eye’ tattoo is depicted strategically on the breasts and the back. Patterns of triangular lines depict mountains and a motif of the sun is tattooed in the middle of the chest. Dots, crosses and circles are the other major shapes that are tattooed in a symmetrical manner between larger and thicker lines. 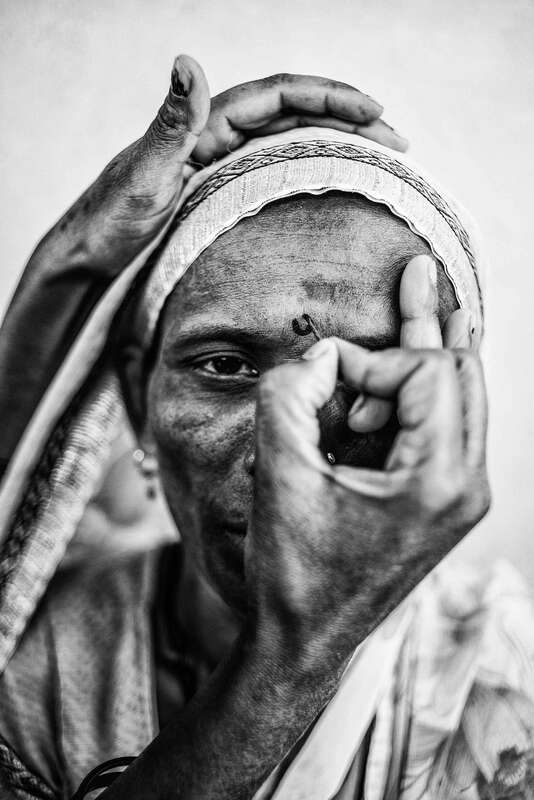 The tattoo on the forehead consists of a symbolic moon shape in the middle and geometric lines continuing above the eyebrows—the placement of this tattoo, I learnt, was the mark of being a Baiga. 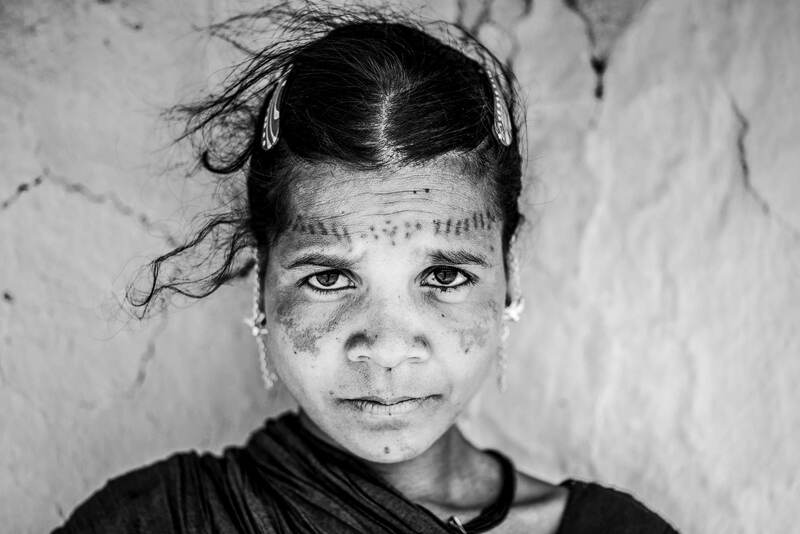 The forehead tattoo is done when a girl is close to puberty, around the age of 8–10 years, marking her entry into adulthood. The back, arms and legs are fully completed by the time she is of marriageable age. However, the thighs are done post marriage, only if requested by the husband. 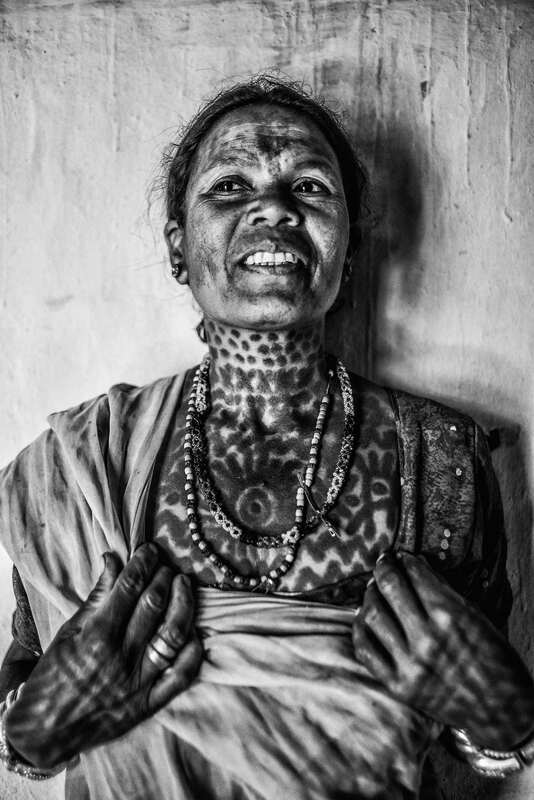 The neck and breasts are generally tattooed after childbearing, to signify that she has now fulfilled womanhood. 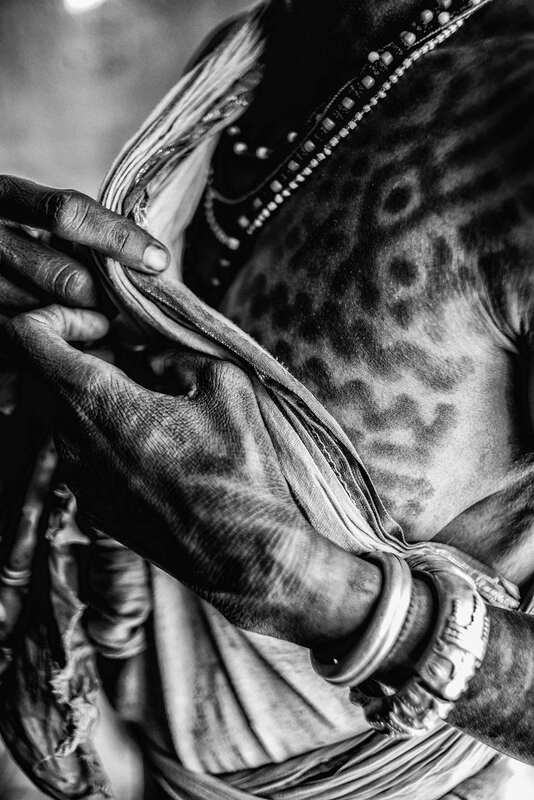 The Baigas do not tattoo themselves, but use the services of the Ojhas. 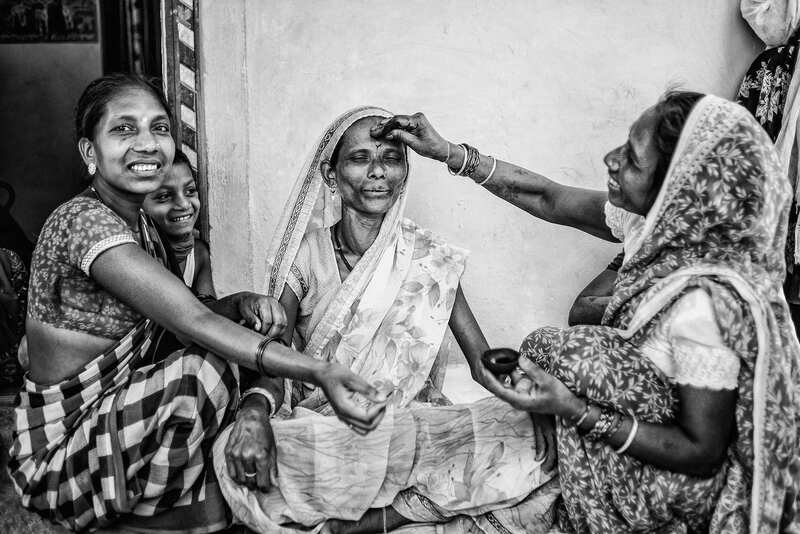 These women, called Badnins, who are essentially tattoo artists, have learnt the art from their mothers and grandmothers. In this way, tattooing has been passed down through generations and designs are made entirely from memory or oral history. They collect soot from a sesame oil lamp and dilute it with water. 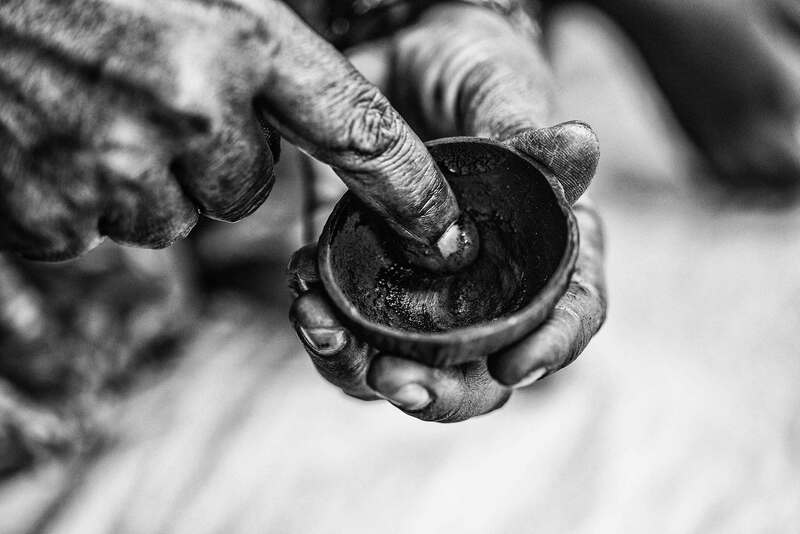 Using a thin piece of wood, first the design is drawn on the body and the liquid soot is then poked into the skin using needles, one prick at a time. For thinner lines, a single needle is used; to make a thicker tattoo, 3–4 needles are tied and pricked together. 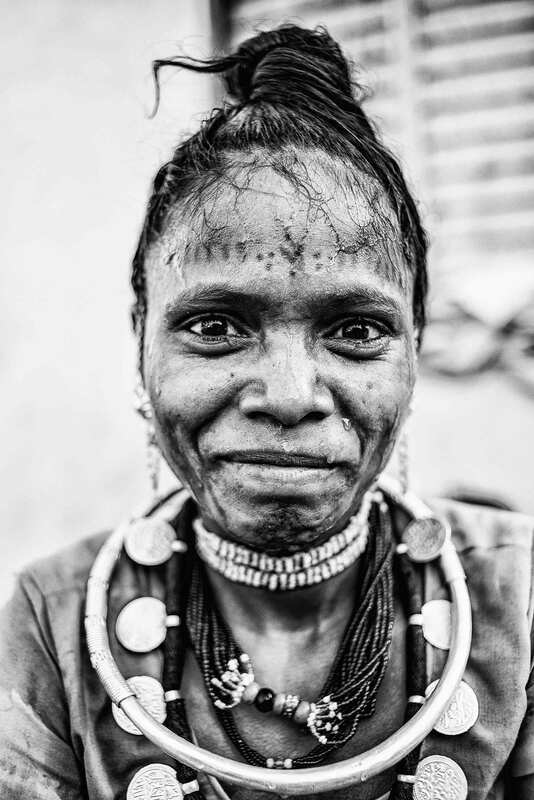 In recent years, due to human migration, deforestation and enforcement of the Forest Protection Act, the Baiga tribe slowly moved out of forest lands and are now living close to small towns and cities. 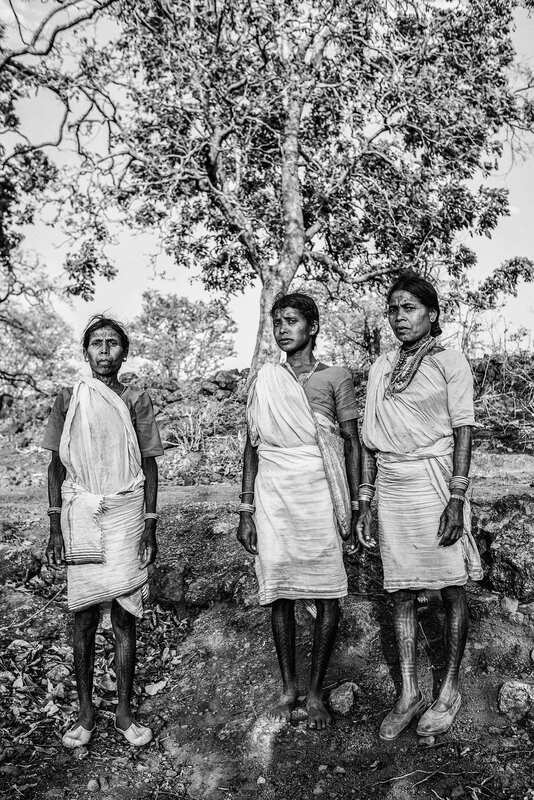 This displacement from their ancestral environment has had an adverse effect on their culture and traditions. 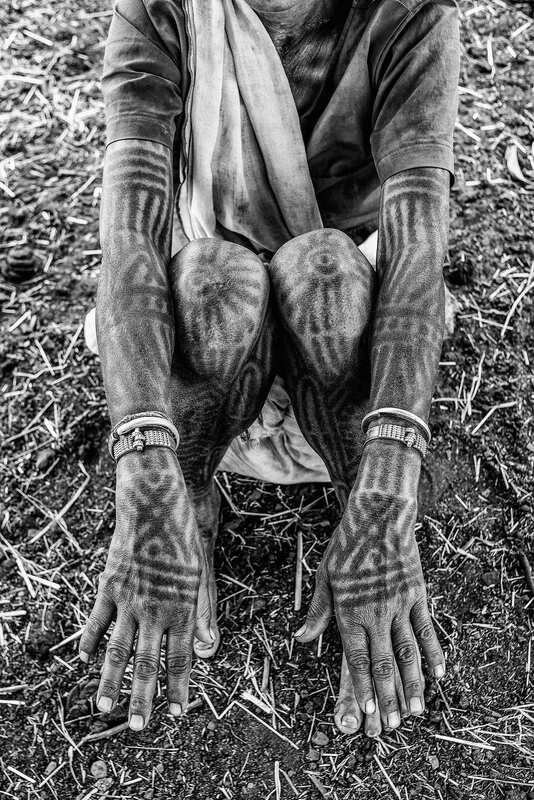 During my travels I observed that the Baiga women who live closer to the cities do not bear the elaborate traditional tattoos. 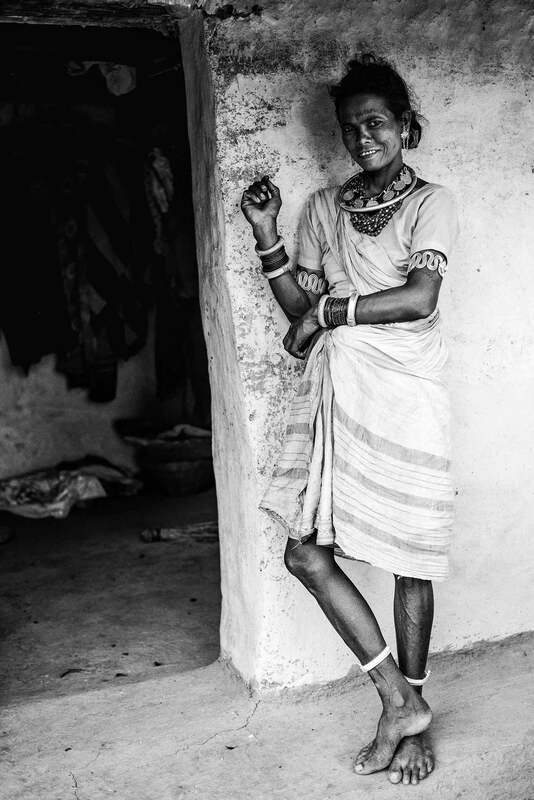 Most of them did have a tattoo on their forehead; but instead of the lines and patterns on their arms and legs, they had smaller motifs which seemed to be influenced by the Gond tribe. 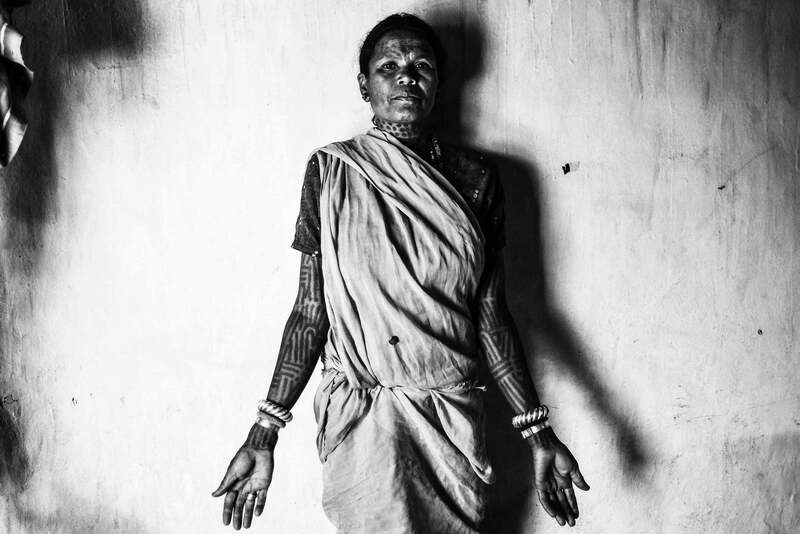 The only place where I found Baiga women with their entire bodies tattooed was in the interior villages in Dhindhori district. It is only the older generation who still carry these marks. I asked a woman why her daughter isn’t tattooed. I was told that she won’t get tattooed as she goes to school and the teachers and children who come to the school from other tribes and villages make fun of her. 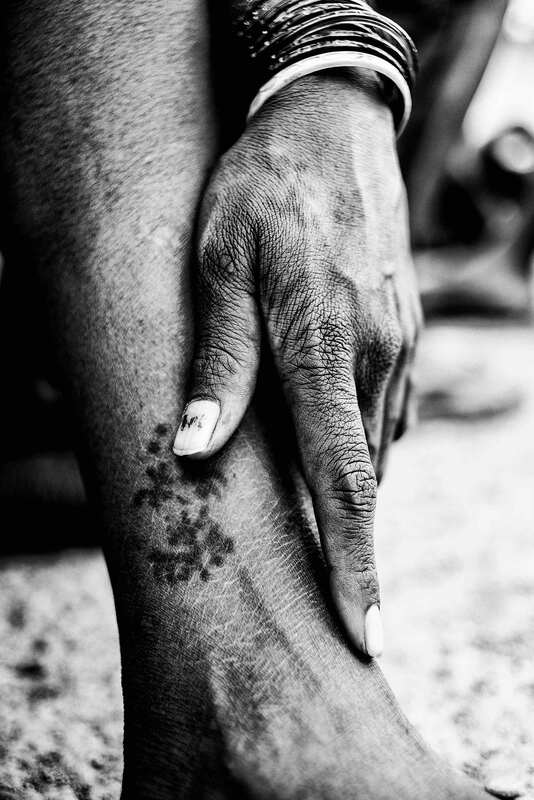 In most of the tattooed tribes, with the death of its older members, the skills and oral memory associated with tattooing will also be lost forever. 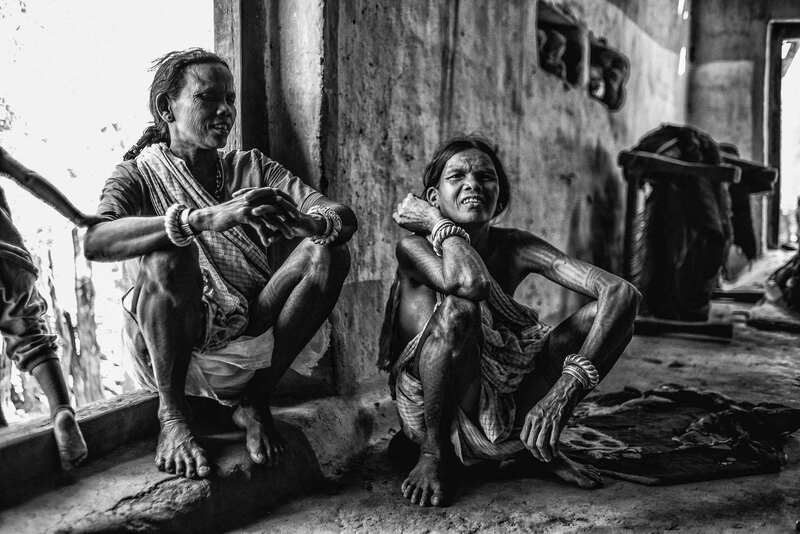 Conflict between urban and tribal values is not the only reason this art form is disappearing. 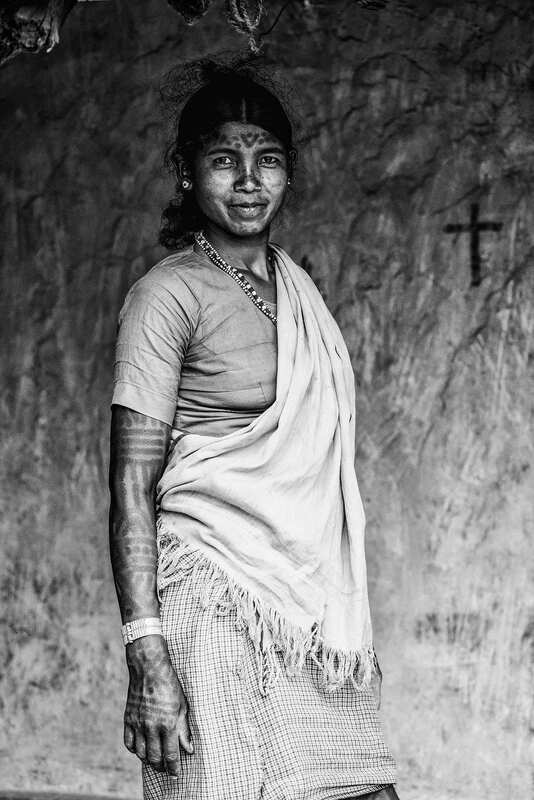 In the last century, there has been a major demographic change in central India due to the influence of Christian missionaries. I found that many members of the Baiga community have converted to Christianity. 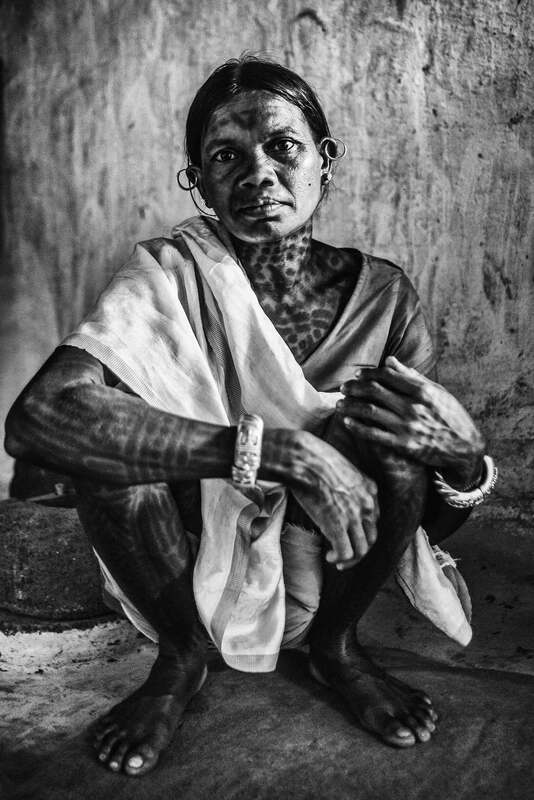 Most of the members of the Ojha community, who according to caste-based traditions were tattoo makers, do not make tattoos any more. 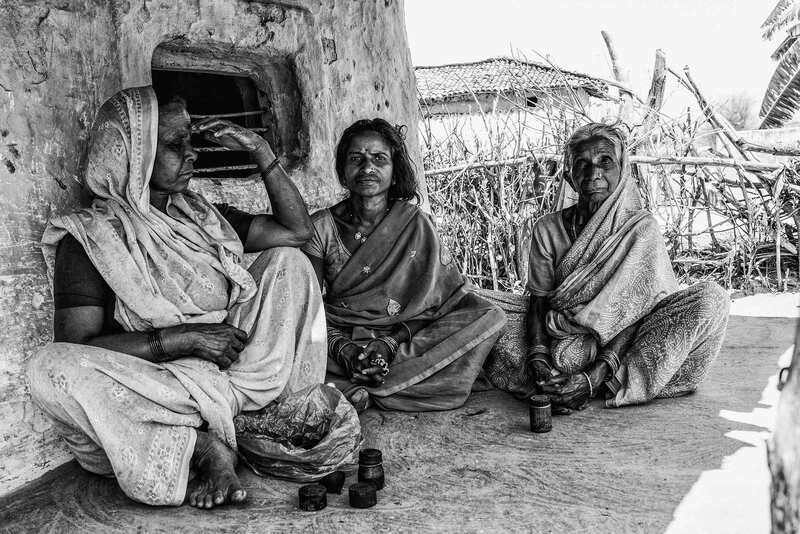 The disconnect of the Baigas from their pagan roots has been a major factor in the steady decline of their native culture and old belief systems. 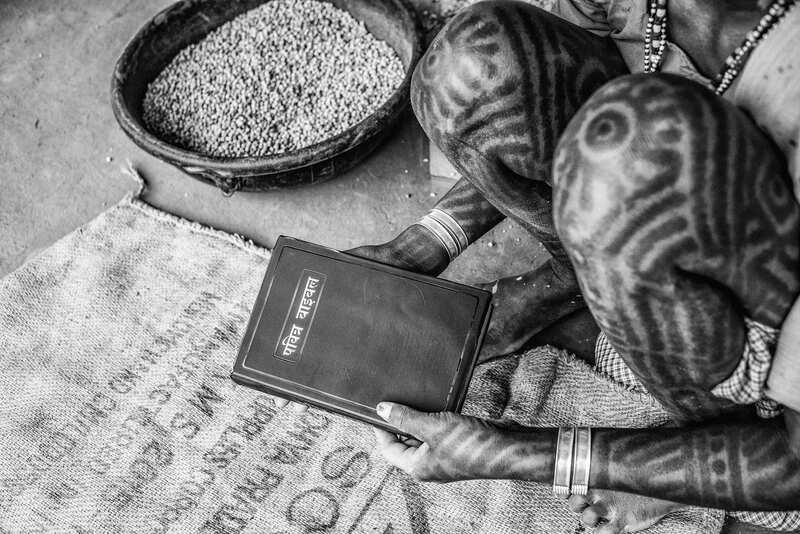 On one of my visits to a Baiga village, a woman happily brought out a Holy Bible for me to see. It was written in Hindi. It was ironic to see her holding the Bible and flipping through the pages when she didn’t even know how to write her own name. 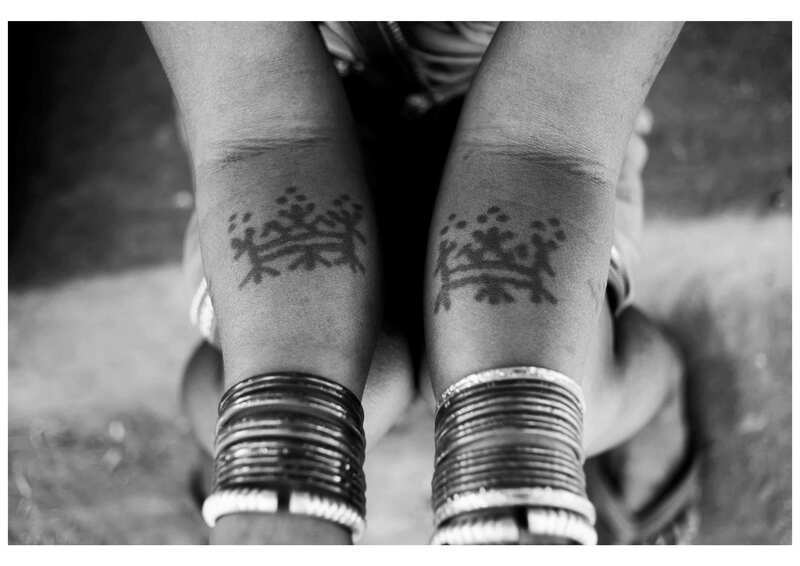 The decline of the tattooing culture among the tribal groups is not a reflection of the overall culture of tattooing in India. With increasing urbanisation, tattooing has gained popularity amongst the young population as a form of self-expression. In the urban space, tattoos are associated with being a ‘rebel’ and being ‘cool’. 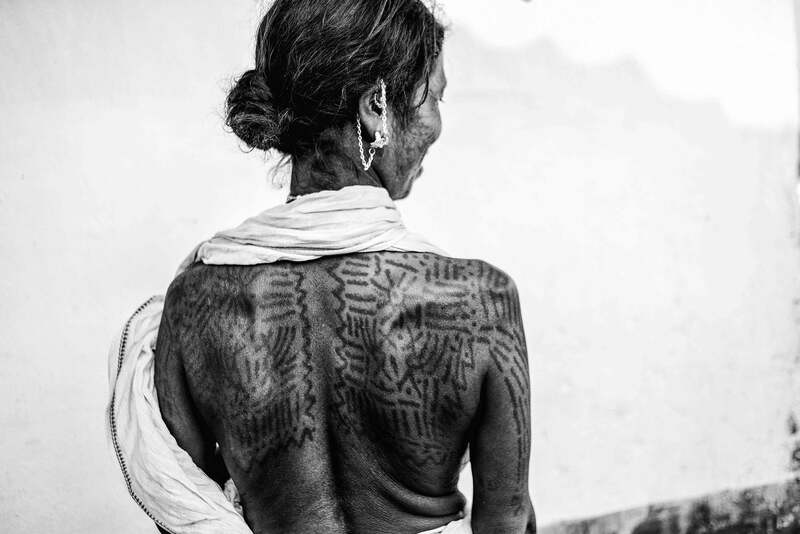 This has created a binary where traditional tattooing is looked down upon as something uncultured and primitive—terms which are derogatory towards the art form and its carriers. 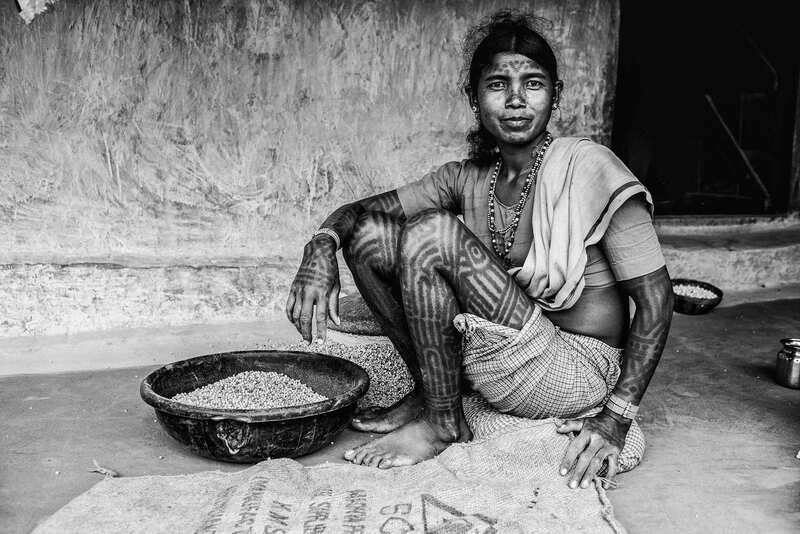 This is ironical, because unlike modern tattooing which is largely individualistic, tribal tattoos are rooted in collective memory, origin myths, local religious beliefs, folklore, ancestor worship, representation of the natural environment, etc., which carry far more value for the people who wear them and holds a shared language and meaning. 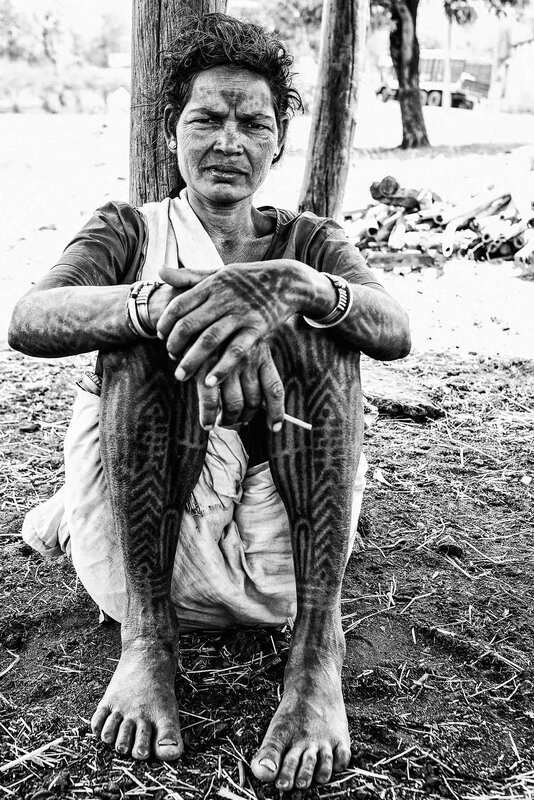 Whenever I travel to the interiors of India, my tattoos become the shared visual language between the tattooed women living in these remote regions and myself. The barrier of spoken language is overcome over mutual admiration of each other’s tattoos and this helps in breaking ice between people who otherwise have very little in common. 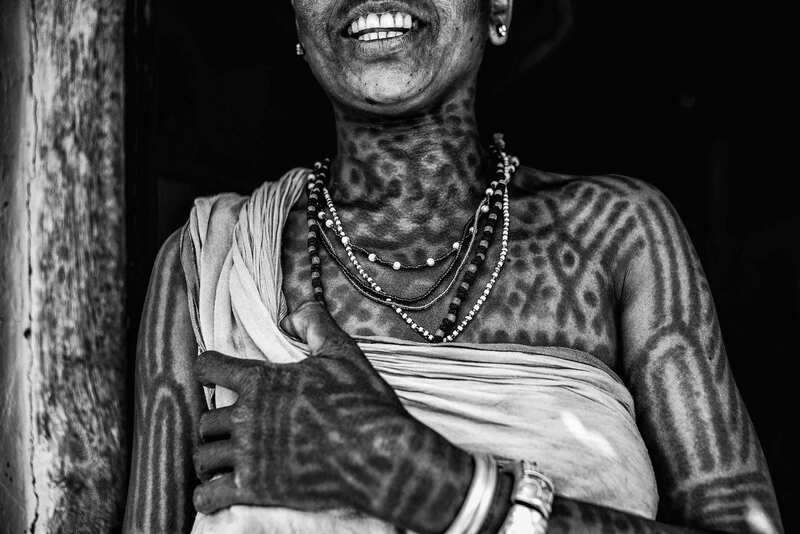 For example, while shooting this photo essay, I was very keen on getting at least one image of tattoos on the breasts of the Baiga women. I was unsure of getting the opportunity as it is an intimate part of the body. I showed the women the tattoos I have on my body and in return they showed me the beautiful and elaborate tattoos they have on their breasts. This trust and comfort that emerged between us was because of the shared history of ink that we carry on our bodies.